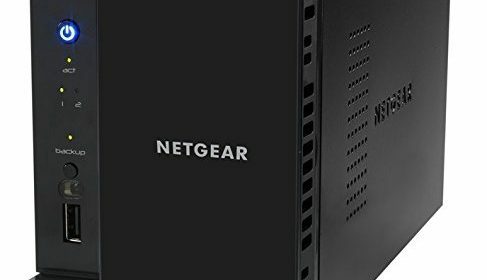 NETGEAR recently introduced the ReadyNAS 2xx family of network attached storage (NAS) devices running 1.4GHz Cortex ARM A-15 SoC. Having just reviewed the ReadyNAS 202, the introduction of the 212 (and 214) bumping the spec from two to four cores, but not the price – still $330 (diskless), came as a surprise. With all of the great features of the ReadyOS 6 (rev’d to 6.4) and twice as much horsepower on tap, we should see a decent improvement in throughput, alongside NETGEAR’s hallmark add: real time 1080p->480p transcoding via Plex for mobile devices. 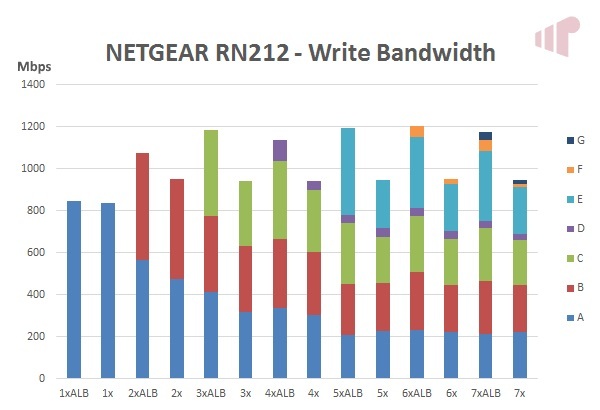 The two-bay NETGEAR ReadyNAS 212, and its four-bay 214 counterpart, look exactly the same as the 202/204 and offer the same physical inputs/outputs. Including two Atheros AR8035 Gigabit Ethernet ports, three USB 3.0 (two rear, one front), and one eSATA, built around an Annapurna Labs AL21400 1.4GHz quad-core SoC and Asmedia ASM1060 SATA controller. By default, the device will select the X-RAID2 system for redundancy (essentially automatic RAID1 for the 212) and drop-dead-simple mechanism for extending pool storage by swapping in larger drives sequentially (obviously allowing time to rebuild in between). External storage cannot join the redundant pool, so it is primarily for backing up data in the pool, as well as providing additional non-redundant capacity. There is a bit of clatter inherent to rotational media, with disk spin up easily audible from a few feet away. Add this to the fan in the back keeping the chassis cool, and the ReadyNAS 212 will make some noise. Not enough to cause uncomfortable sound pollution, but enough to be noticeable if the noise floor in the room is low enough. On the other hand, the power/status lights are bright enough that some electrical tape (or similar) will be required if placing the ReadyNAS 212 in a sensitive area. The entire chassis is solid a well built, including the locking hot swappable drive bays. Which provide the right trade-off between ease of replacement and stopping accidental removal. The ReadyNAS 202 was praised for its simple discovery and setup process, but things did not go as seamlessly with the ReadyNAS 212. While the first run wizard would find the device, no matter how many times I attempted it the process would get to the name/time zone picker and refuse to carry on. Fortunately, there is an “offline” setup method and it worked perfectly (once I found the NAS on my network), and it was fantastic to see the wizard forcing a password change. Given my earlier experience with the ReadyNAS 202, I’m open to chalking it up as one of those maybe-the-cloud-was-on-a-coffee-break-things, but frankly with approachability and “newb” friendliness critical aspects of widening the appeal of these kinds of devices to less savvy users it is an area that needs to “just work”. Link aggregation (bonding): bind the two network interface cards (NIC) in the ReadyNAS 202 into a single logical NIC. There are several options available including 802.3ad and Adaptive Load Balancing, which I selected for the majority of the testing period. Scheduled standby: This is a great way to save power during times that you know the NAS will not be used, but there is a caveat in that it will not take current utilization into account before powering down. So if you happen to be up late one night watching a movie, it will still power down. There is clearly some room to improve here, implementing system idle timers checks (similar to how PCs idle to standby) instead of just a hard stop for example. On the plus side, the ReadyNAS 212 supports wake-on-LAN (WOL) so, if it powers down at an inopportune time, as least you can ask it to power up again without walking over. Alerts: pretty much everything interesting that happens on the ReadyNAS 212 can trigger an email (except power ON). Which is great, if you’re running out of space, a virus is detected, or one of your disks starts to fail. Snapshots: Time base file history. Simply awesome. Especially because of how Btrfs manages them. These must be enabled manually, which I have mixed feelings about. In general, I think that’s probably fine, but it would be nice if the ReadyCLOUD backup folders did it automatically or if there was a preference available to enable snapshots for new shares by default. Apps: Plex, Apache, MySQL, SVN, etc. X-RAID: “just works” RAID where all the complexity is taken care of for you. I was very pleased to see that the ReadyCLOUD client now supports folder selection (it did not a few months ago), and generally works very well to browse files remotely, and backup PC folders wherever the system is located; local network or remote (notice VPN marker in snapshots above). Providing a simple way to give some off-premises data security to a friend or relative. The feature set also extends to those with Android or iOS devices, browsing NAS files and automatically uploading photos straight from the mobile. Deletes are still not echoed to the NAS however. Where they should be, especially with the snapshot feature available. In the current implementation you will end up performing any file maintenance twice to get rid of clutter. A properly configure RAID storage system can provide data redundancy. The ReadyNAS 212 also steps this up by providing local time based file backups via snapshots, but to get complete data security it is necessary to echo data to a remote (off-premises) location. NETGEAR provides the capability to do this via the “Backup” feature, which can leverage several protocols/targets including FTP, FTP+TLS, Rsync, Rsync+SSH, and Windows SMB. Unfortunately FTP + TLS and Rsync failed to function properly, but SMB, FTP, and most critically Rsync + SSH did. NETGEAR has been made aware of the issue with FTP + TLS and are researching the root cause for a fix in a future release of ReadyOS. There are a couple intricacies that are critical when configuring Rsync + SSH, and the UI does not really point this out so a couple screen shots are provided that demonstrate that 1) the public key exported from the backup setup dialog needs to be imported on the target system, and associated with the authenticated user account and 2) unlike the other methods where just the share name is entered in “Path” Rsync + SSH requires /volume/sharename to function correctly. It should also be noted that there does not appear to be a mechanism to use/configure alternate ports for SSH or FTP. This is not necessarily an issue, but it does reduce some flexibility with respect to running multiple SSH/FTP instances behind the same DNS name. NETGEAR was quick to point out that the ReadyNAS 212’s quad core SoC means that it should have enough processing power to transcode a single 1080p video stream to 480p for mobile devices. Unfortunately, this claim requires a reasonably through disclaimer. First, Plex transcoding on the ReadyNAS 212 is very much a work in progress so there some issues with stability, most often surfacing when seeking within videos, but also occasionally when initiating playback as well. Second, 1080p is a really rough marker for what is possible, and it is quite easy to bump into the bit and frame rate limitations. 24p 8-10 Mbps 1080p should generally work, but 60p 8Mbps 720p caused trouble. How useful the feature is will depend significantly on your media library and your expectations. Users with more demanding requirements will still need to pay the higher premium demanded for Intel based NAS. 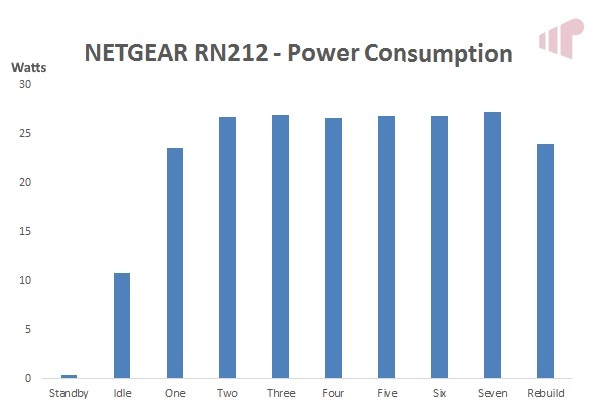 The NETGEAR ReadyNAS 212’s power consumption, was quite good considering its performance and capability, especially at idle (i.e. disks spun down). Pulling just over 10W in that state, and hitting 27.2W with seven simultaneous file operations pulling data from the two Seagate ST4000DM000 5900RPM drives. While transcoding with Plex was a disappointment, the other big “get” from doubling the core count in the ReadyNAS 212 did pan out. With a generous improvement in total bandwidth compared to the ReadyNAS 202; 1887Mbps peak/five clients (RN212) v. 1382Mbps/three clients (RN202). It is worth pointing out, that even when we start seeing a decline at seven clients the total is still significantly higher than the ReadyNAS 202’s peak at three, indicating a far greater ability to serve a larger pool of devices. Clearly moving the ReadyNAS 212 firmly into the small office demographic. 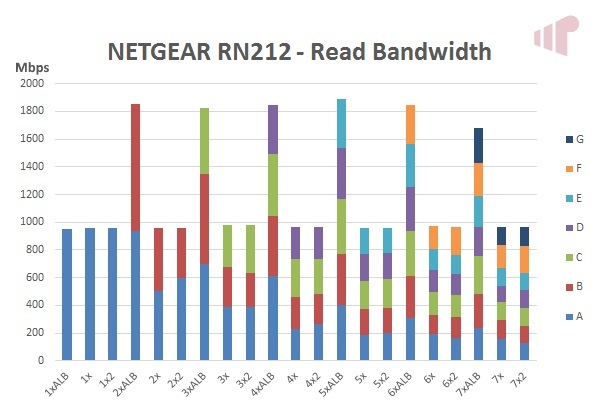 As we can see from the graph above, measuring one-to-seven client read operations in single NIC (#x), dual-bonded NIC (#xALB), and dual NIC (#x2) configurations, there is a huge benefit to enabling link aggregation on the ReadyNAS 212. Adaptive Load Balancing was selected for these tests as I found it to be the most performant and flexible because, unlike 802.3ad it will work with any switch. 802.3ad LACP was also tested with a managed Dell PowerConnect 2808, and works as expected in a configuration where only Layer 2 and Layer 2+3 are available. At some point I would like to test the ReadyNAS 212 with a Layer 3+4 capable switch, which should enable greater than 1Gbps to a single client. Write performance was also impressive, with peak bandwidth achieved at six simultaneous clients pushing 1203Mbps of data. Wrapping up with a quick chart indicating single client read/write performance for external storage devices connected via eSATA and USB 3.0. 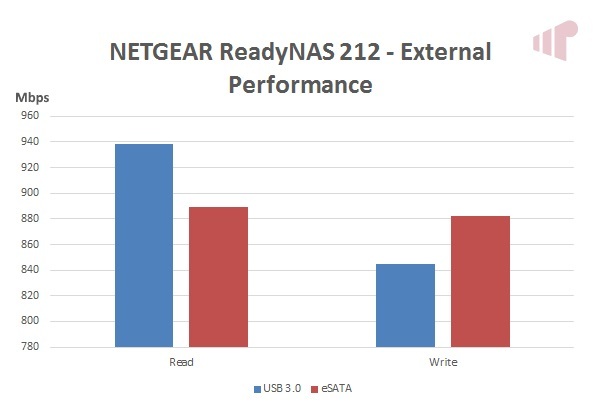 While the NETGEAR ReadyNAS 212 fell a bit short when it came to matching claims around real time 480p transcoding (hopefully this will be addressed), there are significant, tangible gains in multi-client performance and scalability versus the ReadyNAS 202 – which was priced identically at $330 (diskless). It was also fantastic to see NETGEAR address one of my main gripes with the ReadyCLOUD PC application, with free selection of any folder available (no more symbolic links). Hopefully with the next version, it will start echoing deletes and enable snapshots for backup folders by default. It’s just cleaner and more maintainable. Overall, provided that on-NAS transcoding is not a requirement, I have no problem recommending the ReadyNAS 212 for multi-client environments based on its performance and excellent feature set. Those on a tighter budget, or with fewer, less demanding clients might want to save a few quid on the discounting ReadyNAS 202.